GIS 4 Schools provides technical support to The Minnesota DNR Firewise in the Classroom Project. Firewise in the Classroom introduces students to Geographic Information Technology (GIT) through a series of lessons that show students how to use GIT to help protect their homes and community from the threat of Wildfire or other natural or man-made disasters. Firewise in the Classroom is accessed via the Internet allowing teachers to conduct a Firewise Project using MACs or PC computers. Over 110 teachers have attended Firewise training sessions, over 130 Firewise School Projects have been completed, students have completed over 200,000 Level 1 assessment and have completed over 1,200 Level 2 Wildfire Home Hazard Assessments. Fire and Emergency New Zeland (FENZ) has developed a new set of Firewise resources for teachers. Click on: Get Firewise to access new Firewise Lessons, videos and resources that are free. West Virginia Firewise in the Classroom is modeled after Minnesota's Firewise in the Classroom curriculum. GIS 4 Schools developed an interactive GIS application that allows students at any school in West Virginia conduct a Geographic analysis of the risk of wildfire in their community. With the assistance of GIS 4 Schools, students at Hedgesville High School have completed over 2000 Level 1 Risk Assessments in five communities in West Virginia and have taken five field trips to The Woods Resort to assess homes in Sections identified as “High Risk” areas. In all over 700 Level 2 Wildfire Hazard Assessments have been completed. "Firewise at the Woods as a Team Approach” is a slideshow presentation made to the Backyard and Beyond Firewise Conference October 2010 in Denver, CO. Click on Handout to print out a copy of the presentation or click on Notes file an accompanying explanation for each slide. Minnesota Firewise in the Classroom Project. West Virginia Firewise in the Classroom Project. Students analyze their community for wildfire-prone property using aerial photos and geographic information system (GIS) software provided by the DNR. This material is available for Minnesota educators only. Smokey Bear Materials Learn Smokey Bear's Five Rules for Wildfire Prevention! It's easy—simply integrate this exciting, hands-on program into your existing curriculum. This program aligns with National Education Standards for English Language Arts, Science and Social Studies.Wildfire prevention school program »Designed for grades preK–6. Each grade level contains three lessons that include background information, activities, and resources. With Smokey Bear's official mobile site and apps, you'll see step by step how to properly build and put out a campfire. Smokey Bear's campfire safety guide will help keep you, and others, safe when cooking and camping outdoors. Offer products featuring Smokey Bear, the national symbol for the prevention of wildfires, and Woodsy Owl , the national symbol for the promotion of conservation practices. In addition, they offer items that promote fire prevention education, conservation education, and Junior Ranger programs. Classic Smokey Bear posters to rulers and calendars, the NASF Store offers educational materials and products as part of our mission to sustain healthy trees and forests across America. Their materials support the essential conservation education and fire prevention efforts of teachers, foresters, fire departments, and other agencies and organizations. This lesson guide focuses on the economic, social, and ecological implications of wildland fire in Wisconsin and includes one age-appropriate lesson for grade each unit (K–1, 2–3, 4, 5–6, 7–8, 9–12). Lessons are meant to connect students with the management of public lands, help develop skills in issue analysis and problem solving, and educate about wildland fire. Topics include wildland urban interface, fire prevention measures, prescribed fire, and fire adaptations. Lessons will educate students in grades 4–8 about fire and its role in the park. Topics include fire triangle, wildland firefighting, historical use of prescribed burns, fire adapted habits, fuel load sampling, estimation, meteorology, effects of weather on fire danger, and cost of wildland firefighting. Sparky teaches about fire safety, including escape routes, and smoke alarms. 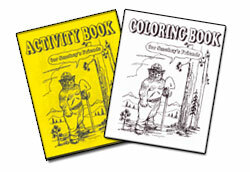 Features games and coloring pages. These multidisciplinary lessons teach what to do before, during, and after an emergency while fostering critical 21st-century skills such as problem solving, teamwork, creativity, leadership, and communication. Embedded with real-world connections. GIS 4 Schools provides lessons that educators can use in their classrooms.